My Renoise hack was Grid Pie. One of the new trends in our community is the concept of a meta-interface. In essence, programmers use the Lua API to transform Renoise into something else, hide the Renoise window, and work with hardware interfaces connected to their own scripts. 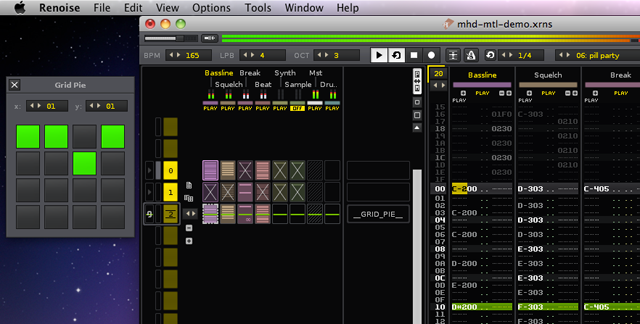 Three current examples: MPE, Step Sequencer Lauflicht and Duplex. Grid Pie is “yet another meta interface.” It turns Renoise into a live performance audio recombination machine. Still in alpha, but people were into the demo I gave. I got a lot of handshakes and positive feedback. It’s an alpha, so your mileage may vary, but I’ll bet this whets some appetites for people who hadn’t yet realized the power of the Renoise API.